Is the age of physical retail stores over? This seems to be the question in everyone’s mind these days. It is true that with the advent of online retail, brick and mortar stores have been affected and the sales declined severely. We have seen big companies like HMT and Blockbuster going bankrupt. However, all is not lost. A recent survey by PwC has found out that consumers overwhelmingly still consider physical retail stores an essential part of the overall retail experience – but it must be connected to a company’s entire offering across multiple channels. The success for retailers lies in understanding what each customer wants and offering them personalised products and interactions to satisfy their needs. What Exactly Is Connected Retail? 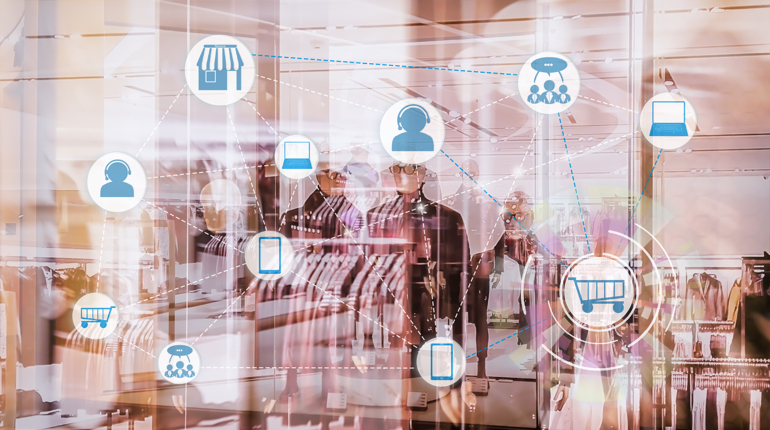 Connected retail technology is linking consumers, devices and data leveraging Internet of Things for smarter shopping experiences, from the high street to online, in-store to mobile applications. Retailers who use the right mix of offline and online experiences for their customers will have the biggest advantage in the future. A connected retail landscape can include everything from apps, analytics to augmented reality. For physical stores to survive in this digital era, retailers must provide a much more interactive customer experience. The retail store should be much more than a simply place to browse and buy. The retailers should aim to deliver an experience that is personalised for the customer, gives them added value and generates brand loyalty. Providing a connected experience through free Wi-Fi in the store can be a good way to increase footfall in the store. Free in-store Wi-Fi gets the customers online and if the customers can get online easily, the uptake for the retailer’s app would increase. This enables a two-way communication with the customer and enables the retailer to collect data that can be used, often in real-time, to offer deals and deliver a more targeted personalised experience. For example, customers in Debenhams, a UK-based retailer, can use its mobile app to scan barcodes to order things for home delivery, read reviews and ask friends what they think about a product from the comfort of the changing room. Augmented reality and digital sign are other ways to keep the customers connected. One emerging technology which the retailers are exploring is beacons, small Bluetooth devices deployed in stores to communicate with the customer’s Smartphone. Beacons give the retailers an opportunity to communicate real-time personalized marketing messages and deals to customers while they are shopping. It also enables to collect data that can give valuable insight into consumer behaviour. Digital labels can display the latest real-time information on products, including things like the number of likes an item has received on Facebook, while virtual reality mirrors can display images of what garments will look like on customers and allow them to share those images with friends over social media. Wi-Fi connected stores, augmented reality apps, etc., are just the tip of the iceberg. Connected retail has the potential to revolutionise the industry and transform how retailers operate and how they connect with consumers. It has the potential to a) Improve service delivery through linking consumer data and research to purchase phases b) Deliver a personalised experience by tailoring products to consumers personal requirements and c) Enhance the brand experience by creating meaningful experiences that move the consumer from transacting to conversing with brands and thereby improve the in-store experience and breathe new life into the dying brick and mortar stores.